GlenRiddle Golf Club (a 36 hole championship golf facility) is the centerpiece of the GlenRiddle residential development located just minutes from Ocean City, Maryland. 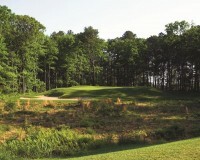 The War Admiral course is routed through mature forest and offers a completely different golf experience. The course is sheltered from the wind, but provides a demanding test from the tees. The site's beautiful tidal marsh comes into play on five dramatic holes, offering amazing views. Rugged, breathtaking bunkers reminiscent of golf's great past is the signature of the War Admiral Course. From the rear tees the course plays to a par of 72 and a length of 6,889 yards.